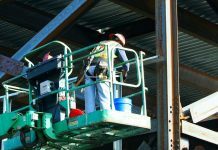 We’re continuing our focus on high-visibility clothing this week by highlighting some of our favorite products to help you stand out on the job. 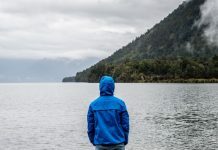 ANSI (American National Safety Institute) has approved three main classes of clothing for visibility: Classes 1, 2, and 3. 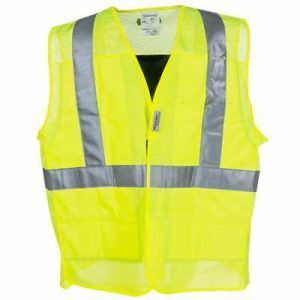 At Working Person’s Store we are proud to carry a wide selection of Class 2 high-viz gear which is meant for workers whose tasks may divert their attention from oncoming traffic travelling more than 25 mph. This includes workers like crossing guards, survey workers or airport baggage handlers to name a few. Our top-of-the-line option for high-viz safety is our Occunomix Hi-Visibility 901 MiraCool Plus Cooling Vest. 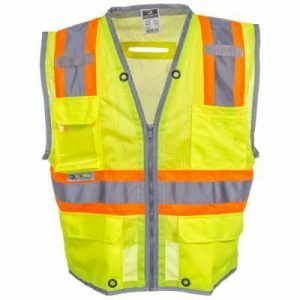 It meets ANSI / ISEA 107 Class 2 standards for visibility and includes yellow fabric with a horizontal 360-degree, 2-inch reflective stripe and two vertical stripes to keep you visible day or night. What sets this vest apart from others is its cooling capabilities. Embedded inside are slim MiraCool cooling crystals. To activate the fast-acting crystals, simply soak the vest in cold water for two minutes. The cold water plumps up the crystals which will keep you cool on the job. Manufactured with soft, lightweight polyester fabric, this safety gear features mesh shoulders and sides to give you even more breathable comfort. There’s also an inside chest pocket . Our Radians Hi-Vis Green SV6H G Class 2 Two-Tone High-Visibility Mesh Safety Vest is our mid-range selection that offers excellent safety as well as many utility features. For high daytime visibility, this vest comes in green with 1” contrasting tape. For high nighttime visibility, there’s 2” silver glass bead reflective tape and reflective trim edging. This Class 2 vest meets or exceeds ANSI/ISEA 107-2010 standards. The vest’s multi-pocket design gives it its competitive edge for those who have a lot of responsibility on the clock. It offers a radio pocket with a clear vinyl badge holder. There’s also a split pencil pocket and lower front cargo pockets with tape grommets. The two inside open pockets are made with solid material for a cell phone or other items. Grommets at the neck are perfect for a tool holder or a lanyard, while the dual mic tabs make wearing a radio mic easy. Crafted from lightweight and breathable ANSI-rated mesh, this vest will keep you cool as you stay safe. The reinforced webbing and heavy-duty zipper closure make it extra durable. If your job calls for a harness, the vest’s D-ring access has got your back. 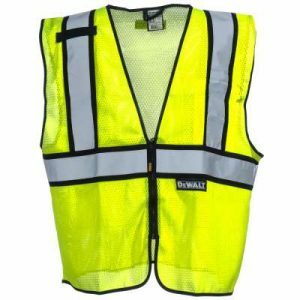 Make sure you’re seen in both bright or low light conditions with the Dewalt Unisex DSV221 Hi Vis Green Class 2 Economy Mesh Vest. This Class 2 safety vest meets ANSI/ISEA 107-2010 standard with 2-inch sewn on reflective tape that has one horizontal stripe across the midsection and two vertical stripes over the chest and shoulders. The stripes extend to the back to give you 360 degrees of safety coverage. Designed to fit over uniforms, workout clothes or work clothes, this vest is perfect for outdoor working conditions and is made with lightweight and breathable 100% polyester mesh that won’t add heat. 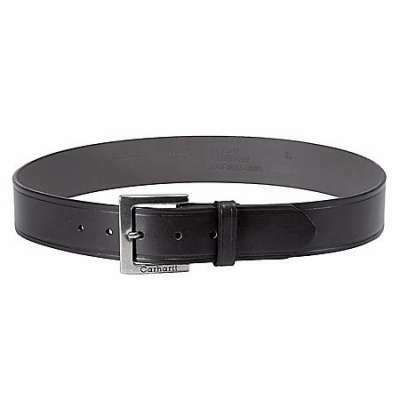 The durable stitching is reinforced at stress points for longevity. The left chest panel has an inner pocket, and the right shoulder has a single mic tab for safe, convenient storage of cords or wires. The short zipper closure stops mid sternum for a deep v-neckline. 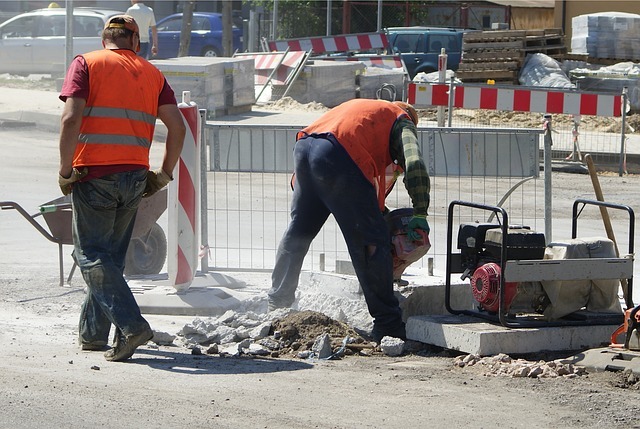 No matter what type of work you’re in, if you need to be seen, make sure you are equipped with the right high-visibility protection. View our full selection of high-visibility gear at WorkingPerson.com.